KVOA-TV -- Tucson, August 13, 2004. KOVA' investigative reporter, Tom McNamara and team in just one hour during this stakeout along the border between Douglas and Bisbee, counted one hundred and ninety eight illegals. Five different groups crossing into the U.S. without resistance.... They called the Border Patrol, but no one ever came....Later they checked the Border Patrol logs....the agents found no signs of illegals in the area. On the weekend of August 28, 2004, Hal Netkin visited Arizona based American Border Patrol to see for himself, how easy it is for terrorists to simply walk over our southern border. August 2004, shown above, is Hal Netkin and his daughter, both standing in Mexico separated from Palominas, AZ, by the damaged barbed wire fence. Border crossings at rough terrain points such as this one are easily accessed with some conventional vehicles and certainly with any four wheel drive vehicle. Our car trip to and from this crossing point went unnoticed -- in fact, we did not see or hear any other vehicles or aircraft the whole time. A terrorist who could cross the border with a WMD, could easily be picked up on the Arizona side of the border by accomplices and be driven to any major city unnoticed. 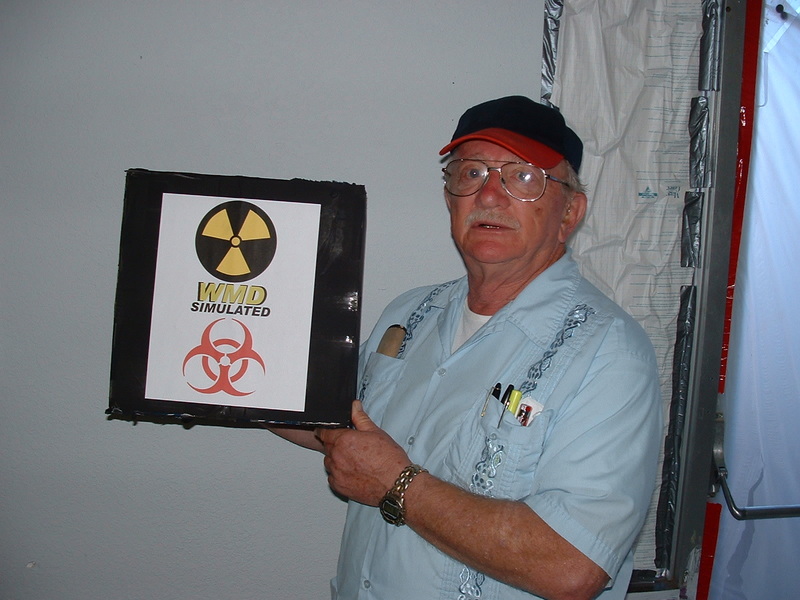 Shown below, Hal holds simulated WMD at a Sierra Vista safe house. Shown below, the simulated WMD is placed in back of Hal's car to be transported to Los Angeles. Aguilar doesn't know it, but the simulated WMD was transported from Sierra Vista north through a Border Patrol inspection point near Benson, AZ, to a safe house in Los Angeles. The Associated Press Reported on August 31, 2004, that the new Border Patrol chief, David Aguilar, said the southwest border is now secure.